A charming Dormer style town house situated on a quiet street only 3 minutes walk from the town centre of Lismore. An Excellent hub from which to explore the West Waterford/East Cork Regions. 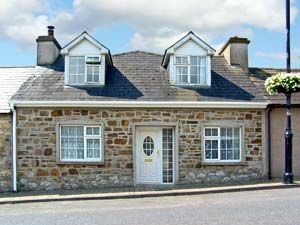 The house provides spacious, comfortable accommodation comprising 2 double, 2 single bedrooms with master bedroom ensuite and a 4ft double downstairs, sleeping 7/8 people. The main bathroom is upstairs and there is another WC and shower downstairs. The living accommodation comprises of a large lounge with a hand crafted raised open fire place, utility room and a large kitchen diner which opens onto the beautiful sunny south facing patio and enclosed garden. A home from home with all the conveniences you need close at hand. From Cork direction coming from Fermoy on the N72, enter the 50kph zone after 300 yards turn very sharp 1st right into Ballyanchor Rd, (School Rd) then take 1st left onto New Street 150 yards. House on right 200 yards down. From Waterford direction from Dungarvan follow the N72 over the bridge and past Lismore Castle, enter the town and you must stop at monument by the hotel. Turn right and take 1st left after 150 yards at West End Bar into Lower New Street, follow on turning right up hill. House on left 200 yards up Rd.